Eat your heart out with your Valentine, show your love for the arts, cook up some romance at the chef’s table, and more. 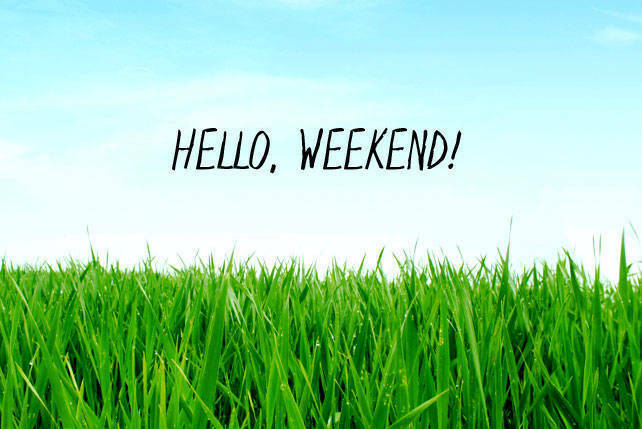 (SPOT.ph) We know you’re already looking forward to the most romantic weekend of the year! We zero in on the events you shouldn’t miss. Pasinaya, the Cultural Center of the Philippines' annual open house, multi-arts festival, celebrates the integration of ASEAN countries. 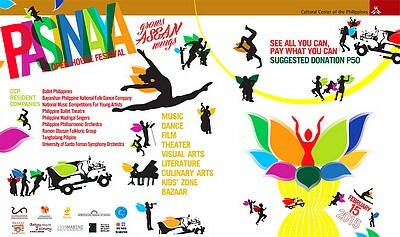 This year, with the theme "Pasinaya Grows ASEAN Wings," Pasinaya includes the ASEAN Performance Arts Market that runs from February 13 to 15 at the Cultural Center of the Philippines. On Sunday, Pasinaya opens at the CCP with an early morning pre-show at 7:30 a.m., featuring the Marcelo H. Del Pilar Performing Arts Group, Marikina Dance Guild, and the La Salle Dance Company-Street. This will be followed by the official opening ceremonies and street parade featuring the Citizens' Brigade Band of Dasmarinas, Cavite and the Sindaw Philippines Performing Arts Guild. For more information, call 832-1125 local 1600 and 1606. 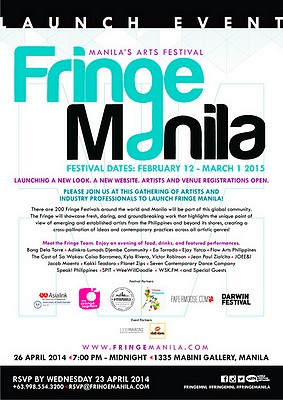 The	internationally	acclaimed	multi-arts	festival,	Fringe,	is	taking	over Manila	on	February	12 to	March	1 as	its newest	destination under	the	banner	of	Fringe	Manila, for	a	strictly	limited period,	in	venues	across	Manila,	with	a focus	along	the	spine	of	Vito	Cruz,	from	the	De	La	Salle-College	of	Saint	Benilde	in	the	East,	to	the	Cultural	Center	of	the	Philippines in	the	West. Fringe	Manila	is	an	open-access,	artist-driven,	uncensored	arts	and	community	festival	that	will showcase	fresh,	daring,	and	groundbreaking	work. It highlights the	unique	point	of	view	of	emerging	and	established artists	from	the	Philippines	and	all	over	the	world, making it the perfect	platform for artists	to	take	risks	and	share	their	work with diverse	audiences. For more information, click here. For ticket inquiries or reservations, call 891-9999. 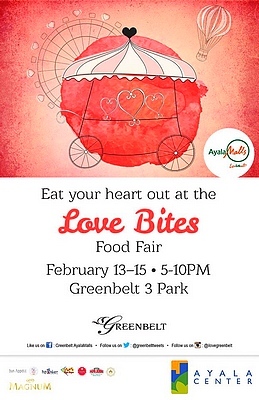 Get in the mood for love at Love Bites Food Fair, happening from February 13 to 15, 5 p.m., at the Greenbelt 3 Park. Eat your heart out with Teddy’s Bigger Burgers, Papa John’s Pizza, Cupcakes by Sonja, Bun Appetit, Mister Fluffies, Pepi Cubano, Alchemy by Meryl, and Magnum. Enjoy special performances by Flippin Soul Stompers, Gabbi Buencamino, and Blue Rascals. 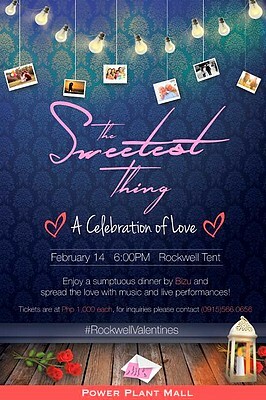 Get your tickets to The Sweetest Thing: A Celebration of Love, happening on February 14, 6 p.m. at the Rockwell Tent. Enjoy a sumptuous dinner by Bizu, with live music by The Brass Monkeys and Verse One, and beats by DJ Mike Constantino. Spread the love with good food, music, and live performances! Tickets are priced at P1,000. For ticket inquiries or reservations, call 0915-566-0656. Relish fun and romance as you learn to cook exciting dishes with your Valentine. 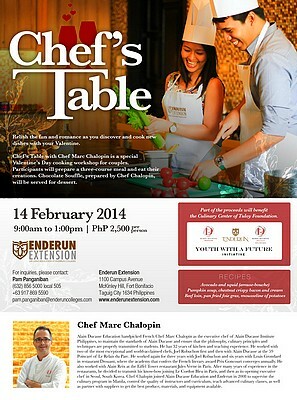 Sign up for Chef's Table with Chef Marc Chalopin: Valentine's Day Special for Couples, happening on February 14, 9 a.m., at Enderun. Chef's Table with Chef Marc Chalopin is a special Valentine's Day cooking workshop for couples. Participants will prepare a three-course meal, then eat their creations. Chocolate Souffle made by Chef Chalopin will be served for dessert. The workshop fee is P2,500 per person. 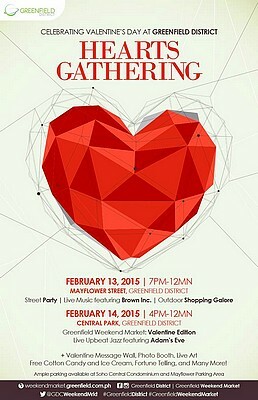 Celebrate the season of hearts with other couples at Hearts Gathering on February 13, 7 p.m., and February 14, 4 p.m., at the Greenfield District. Spend Friday night at a street party, featuring Brown, Inc., and shop till you drop! On Valentine’s Day, feel the love at the Valentine’s edition of the Greenfield Weekend Market with live upbeat jazz music from Adam’s Eve. Enjoy the Valentine message wall, a photobooth, live art, free cotton candy and ice cream, fortune-telling, and many more. 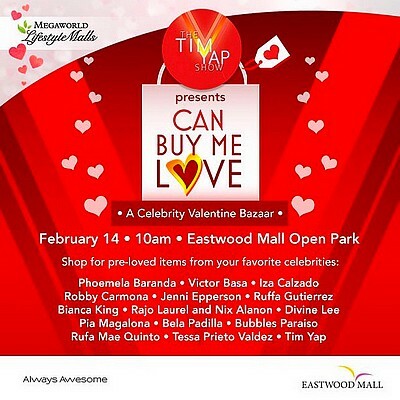 On Valentine’s Day, Tim Yap will be hosting Can Buy Me Love: A Celebrity Valentine Bazaar. Drop by the Eastwood Mall Open Park on February 14, 10 a.m. Shop for pre-loved items from your favorite celebrities: Phoemela Baranda, Victor Basa, Jenni Epperson, Bubbles Paraiso, Tessa Prieta-Valdez, and many more! For more information, call 709-9888, 709-0888, or 0917-838-0111. 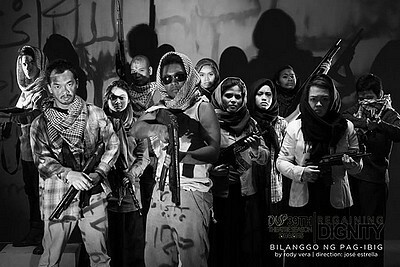 Make sure to get your tickets to Dulaang UP’s Bilanggo ng Pag-Ibig, running from February 11 to March 1 at the Wilfredo Ma. Guerrero Theater. This theater production is based on Jean Genet’s last opus, Prisoner of Love, which traces Genet’s life as a petty thief and artist-genius, a convict and one of France’s literary giants, a degenerate liar and staunch activist, a terrorist ally and lover to a guerilla. Tickets are priced at P350. 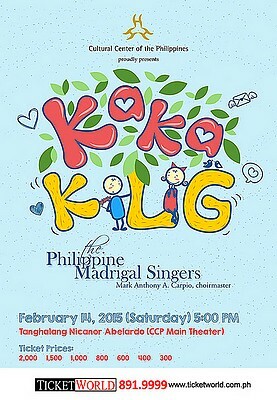 Experience being serenaded by one of the most awarded choirs in Asia and around the world, the Philippine Madrigal Singers, in their Valentine concert entitled KakaKILIG! at the CCP Main Theater on February 14, 5 p.m. Listen to old favorites and exciting new compositions. Tickets are priced at P5,150, P2,060, P1,545, P1,030, P824, P618, P412, and P309. 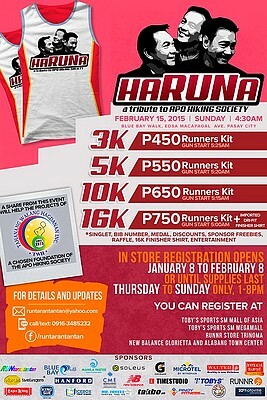 Feel the love and relive the music at HaRUNa : A Tribute to APO Hiking Society! Have a good run with your friends, family, or the love of your life on February 15, 4:30 a.m., at the Blue Bay Walk. Registration is priced at P450 (3K), P550 (10K), P650 (10K), and P750 (16K). For more information, call 0916-348-5232.